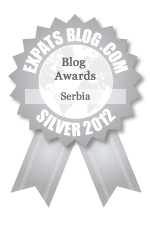 ExpatsBlog.com Expat Blog Awards 2012: Serbia Silver Award! This blog won the Silver Award for best expat blog in Serbia! I am a huge fan of Laura's blog, because she talks about the small things of life in a sensitive and tactful way. A great blog!